Handmade and beautifully presented in one of our signature glossy white gift boxes, the Faceted Crystal Heart Wedding Pendant Necklace is a delightful piece of jewellery for bridesmaids, maids of honour, and flower girls. Crafted in the finest precious metals, it is available in sterling silver, rose gold vermeil, or yellow gold vermeil, and each necklace features an enchanting faceted crystal quartz heart that sparkles elegantly in the natural light. To create a one-of-a-kind gift for each member of your bridal party, this Wedding Pendant Necklace can be personalised with the charm of your choice (heart, disc, star and initial options available), which can be hand stamped with any initial to make it truly unique. The initial on the heart, star and disc charms will be patinised ("black finish"), so it stands out, or we can leave it silver or gold (clean finish). The initials are hand stamped onto the charms so each one will be unique. We are only able to stamp one initial onto each charm and we are only able to offer capitals. Your crystal wedding necklace will be beautifully gift wrapped in a signature Bish Bosh Becca glossy white box, tied with white organza ribbon edged in satin and a gold foil gift card enclosed, making it an ideal gift. The message on the gift card says "there is no remedy for love but to love some more" or for the bridesmaids the card says "its the friends you can call at 4am that matter"
Sterling silver, rose gold vermeil or gold vermeil (gold plated sterling silver) and natural crystal quartz. There are 3 chain lengths 14"/35cm length chain for young children, 16"/ 40cm and 18"/ 45cm. The crystal heart is approx 11mm by 11mm wide. It hangs approx 20mm from a sterling silver link chain. The disc is approximately 9mm, with the loop it hangs approx 12mm. The heart is approximately 10mm by 10mm wide, with the loop it hangs approx 13mm from the chain. 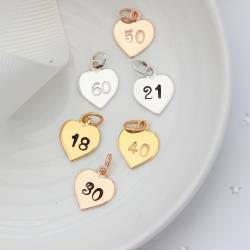 The initial charms vary depending on the letter but are approx 10mm long and hang approx 12mm from the chain.